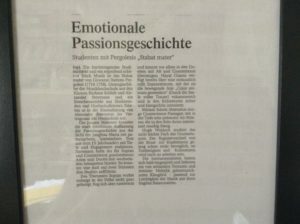 I performed the whole of Pergoleisi Stabat Mater with the girls including Eva Trummer and Hayatt Chaoui for which I received criticism in the Wuppertal Times. I did tow solos there Fac ut Portem and Eja Mater. Plus all the choruses. I only made 1 mistake. Sadly it was an obvious one. That’s where it is with singing but I have improved leaps and bounds in recent years as a bass. I just want to prove to everyone that they didn’t waste their time with man I could do it when I really believed in myself. Off the back of a successful performance of Marienvespers by Monteverdi with her husband Karsten Zündorf I was head hunted by Karsten to sing for his wife together with my friend Eji Mirua international Bassist and the Korean tenor Park. 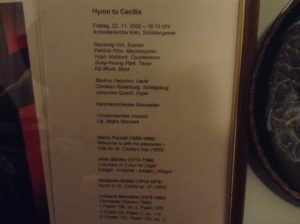 We sang the First Ode To St Cecila’s Day Welcome to All the Pleasures by Henry Purcell on 22nd November 2002 in the Antonieterkirche, Cologne Schildergasse, right in the city centre and a repeat performance at Brauweiler Kirche in the suburbs the next day. I got 200 euros for those two performances. Mr Stevenson got me a job in the summer opera at Junges Theater Göttingen in 2002 where I met the love of my life only to have her stolen again from under my nose, but we held on and had a relationship and friendship for seven years with each other. We went out and some else took my place when I rested my voice at the first night party. 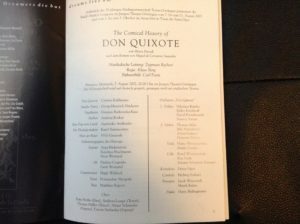 All I remember of Don Quixote is asking her to do up my bra, because the director had me playing Dulcinea Don Quixote’s wife and I had to run on stage passed my friend and her other lover making out and do a girly high pitched giggle and kiss the rather sweaty leading man having been bent back over his knee. I just went down to the gents and screamed! She is gorgeous as well. I got my revenge and peck her one on the lips when he went home and ask her out anyway. I still love her for it today. I just remembered the line from Purcell’s Fairest Isle ‘jealousy that poisons passion and despair the dies for love’. Don’t be jealous on any account is what prayed to myself over and over and in the end I was so jealous I destroyed myself after 7 years of When Harry Met Sally. So funny the relationship of my life. Much more fun that being married to one. I san 5 performances with them. Secrecy’s aria from the Fairy Queene and Riding through the Whistling Air and opened the show with the lovely Paulina singing Let the Fifes and the Clairons plus all the choruses from King Arthur and Dido and Aeneas. I got 1000 euros for it plus three weeks rehearsals, accommodation and food. 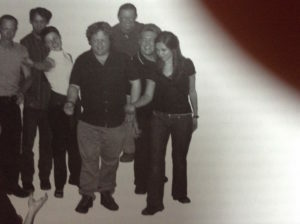 I was so professional I kept calm and carried on and they hated me because they were his friends. I got nothing in opera as a result and I really deserved it. They condemned me for not being interesting enough with her. To be honest they are damn lucky I didn’t walk out. I tried to be as professional as I could, she was really the first girl who really loved me and I was devastated. Mattias Repovs and Karolina Brachmann. I really didn’t mean to get into singing college again. It just happened by sheer chance. I’d changed tack completely and done a CELTA course in English Language Teaching to teach companies in Germany English. I was very young and fell out with a difficult boss and my friend was a Canadian Choirmaster and went to see the Kassel Bach Choir concert in 2001 when they sang the Christmas Oratorio and I really meant “No!” to singing again and because there was a mild attraction between us despite me being heterosexual and him being gay he talked me into it. So, it actually gay love from my only proto-boyfriend that is responsible for me giving it another go as a countertenor. I ended up having an affair with woman in that choir and it got me back in the door. She was 11 and a half years older than me. We sang the Bach St Matthew Passion in Fritzlar Cathedral and St Martin’s Church in Kassel together. Off the back of that. 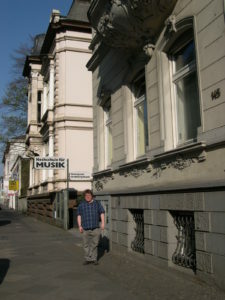 I got lessons with Alexander Stevenson the head of vocal studies at the Kassel Musikakademie. The American hero tenor. 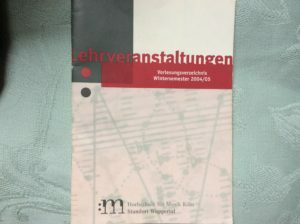 He got me a place to study in Wuppertal, a satellite college of HfM Cologne with Jan Ehnes my piano teacher, Alex Pulaiev the accompanist, and himself and head of vocal studies Barbara Schlick who was a recording artist for Philippe Heereweghe and Harmonia Mundi JEG and others. She was my favourite girlfriend’s teacher and her best friends teacher and they are both famous singers. Particularly my girlfriends best friend. Her professional CV is a lot longer than mine, but I feel that’s because I was a bass / baritone and not a counter. The countertenor didn’t work out their either, but I wasn’t allowed to try being a bass because my relationship with Stevie sadly broke down and he was a good friend. He was a great teacher but we were too similar him and I in personality. I love him as a person. He just didn’t have the right skills to compliment me musically, though he was brilliant at pastoral care. It wasn’t his fault because he cared about me. It’s just that Jan was far better at disciplining me and making me love what I was doing. I passed my final honors second study piano exam and not the singing and all my theory. In fact, I got 7/9 exams for the ZP in the Regelstudienzeit with language of instruction German. Including musicology, general music theory B, form studies, dictation, harmony and counterpoint. Italian I didn’t enter myself for yet which was acceptable, but sadly the countertenor was not up to scratch. It was the wrong voice for me. I couldn’t deal with the constant bullying from men and women about countertenoring. I have sympathy with all women who actually make it in a mans profession because I found it murderous in singing a female voice. I killed my voice though partying and trying to have a decent relationship. It’s totally gone now it finally broke and I can only sing bass. Smoking cigarettes and cuban cigars killed it. I’ve given up now I’m diabetic. I was offered a resit but turned it down and went for a change of study to musicology to try and become a composer. If I had known that GSMD was essentially a finishing school and not a school of music and drama I wouldn’t have applied, because I wasn’t good enough for them at that stage. The main problem was I didn’t have enough life experience and I was still hadn’t had a girlfriend and I got myself into big trouble with the American tenors trying to nick one or the other off him. As a countertenor I just got bullied out of commission like Happy Gilmour on the ninth green when they turn on the sprinklers. I loved them for being that clever though. I like to think I have made something of my music in honor of them giving me that place.I don’t feel I’ve let them down because of my talent for theory and composition and for bass / baritone as was mentioned in Lowe’s reference and I was never given a chance with. I still have immense respect for the college and still receive their alumni publications. I had Ian Kennedy of the BBC singers as a teacher. He had a sense of humor and was very kind. A singing gold medal winner who got bullied out of commission like me too. He’s a lovely guy Ian. He just hangs on in there. After my early singing career I decided against languages at university for the time being and to apply for music college in London, Birmingham, and in Manchester. I went for a pre-audition at GSMD with Jo Peters and she recommended me applying for as many music colleges as I could afford in one go. So I went for GSMD, RAM, RCM, RNCM (Manchester) and Birmingham Conservatoire. My advice is do the same programme at every college. That way you won’t get so nervous and will gain confidence during the audition process. My programme consisted of three pieces A Swan by Grieg, But Who May Abide from Handel’s Messiah (done from memory with my ornamentation from a rare Oxford record in the 1970s which I had for my GCSE set works and my own cadenza worked out by me and Patrick McCarthy). I got a complimentary rejection from RNCM. I was up against Catherine Jenkins at RAM so no chance there despite knowing David Lowe in the audition from Eton College, a flat no from RCM despite having Ashley as my teacher and a massive compliment from the accompanist, and then partial success in Birmingham they liked me as a singer and sent me through to the academic interview. I made a complete blunder there. 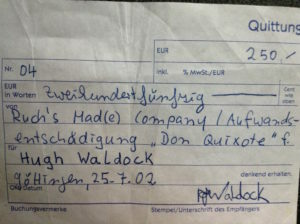 He asked me what my favorite composer was and I tried to impress him because I knew Sir Simon Rattle was there and he was into 20th Century stuff so I said Sir Harrison Birtwhistle and they said “Name a work by Sir Harrison Birtwhistle?”and I replied shyly “Sorry, I can’t!” and he said “Waldock, waiting list! I’ve got to think of the academic reputation of my college!”. Then I got into GSMD just before Christmas because I let Bernard Lanskey do all the talking in the interview and zipped my mouth well and truly up.